I am practicing again on making cakes. I am making this same cake on Saturday for my Aunt's dinner party. I have never used a filling in my cakes but she wants a raspberry filling in her cake. I think I have figured it out. I made the raspberry filling by cooking fresh raspberries, sugar, water and lemon juice until the berries are all mushed up and there is a lot of juice in the pan. Next I mash the berry mixture through a small strainer to get all the seeds out. This produced about 1 C of raspberry juice. I returned the juice to the stove and thickened it up with corn starch. 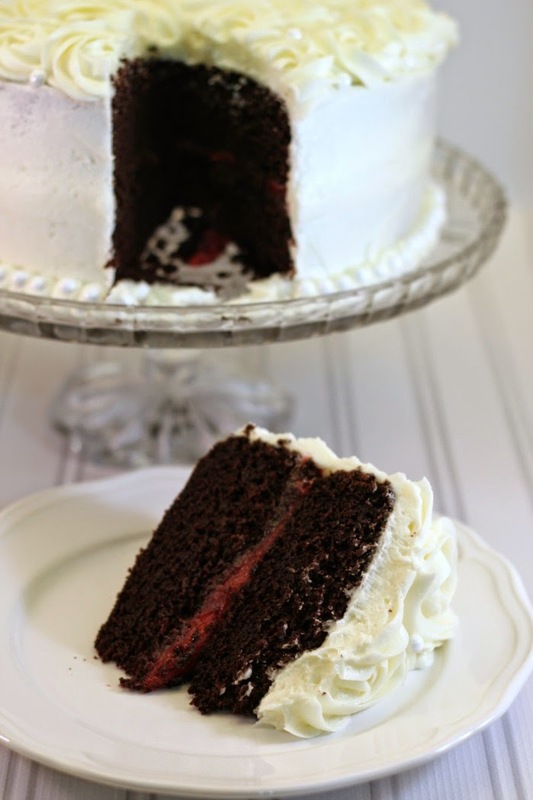 In the above picture you can see the filling spread on the bottom cake layer. 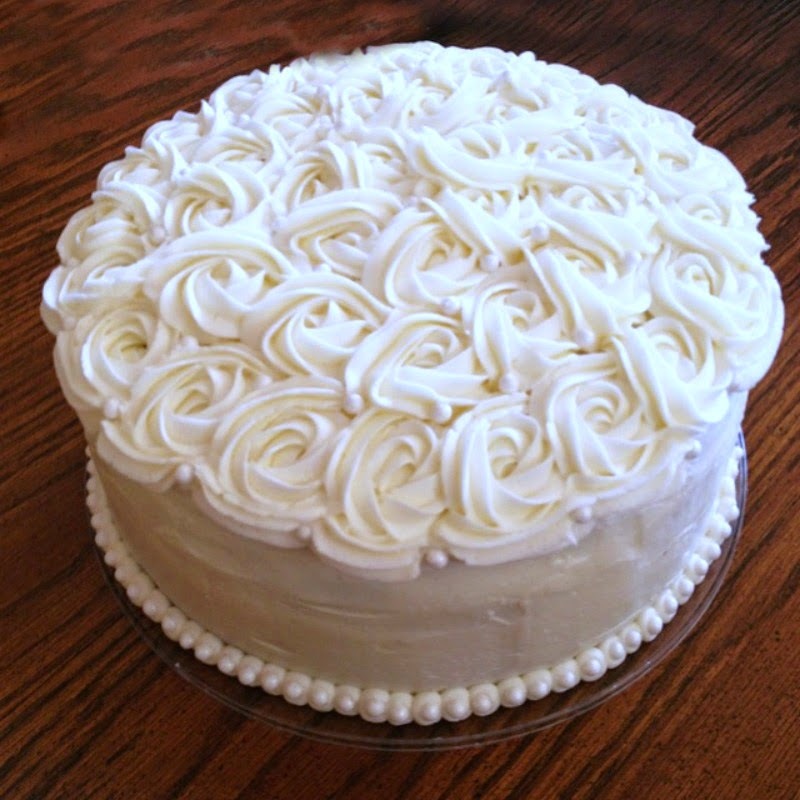 I piped some icing around the edge so to keep the filling in the center of the cake. Next place the top layer onto of the filling. Now the cake is ready to ice. Preheat oven to 325 degrees. In large bowl add all dry ingredients. Add coffee, oil and butter milk to dry ingredients and mix until combined. Add egg and vanilla and mix for 2 minutes. Pour batter into 2 greased (I used butter) and floured 9 inch baking pans. Bake for 30 minutes or until toothpick inserted in the middle comes out clean. Cool slightly in pans and then remove cake to cooling racks. In a sauce pan mix together raspberries, sugar, lemon juice and water. Cook over med/high heat until the berries fall apart and become very juicy. Pour raspberry mixture into a strainer with small holes and push the juice through. Discard the seeds and pulp that remain in the strainer. This should produce about 1 Cup of sweet raspberry juice. Put the juice back in the pan and stir in the corn starch. Cook the raspberry mixture until it thickens up and is like a gel. Cool before placing between the layers of the cake. So glad to see you at Best of the Weekend, Nina! That looks beautiful. I bet that raspberry filling is wonderful all wrapped up in devil's food and buttercream. I am usually a white cake girl too... but I am pretty sure I'd love this! That looks so decadent and wonderful!! I usually choose lemon, but this cake reminds me of my grandmother. She made wonderful cakes with raspberry filling. I wish she was here so I could share your version. She would love it. Those roses are over the top. Hi there! Visiting from Whimsy Wednesday. This looks delicious and is so beautiful! Thanks for sharing! Oh boy, I love finding posts like this. I have a thing for layered cakes! It looks fabulous! thanks for sharing. I just love chocolate and raspberries! Beautiful cake! This cake is gorgeous! You did a great job on the frosting! Visiting from the Freedom Fridays linky party.